There's a book out... Wine Dogs of the USA. My owner saw it at Wy'East Vineyards when she visited recently. 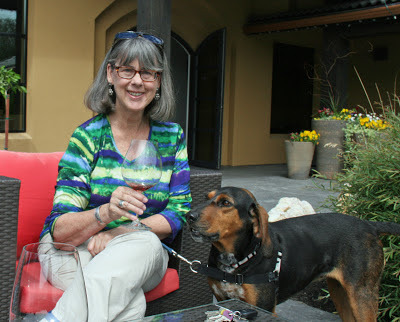 I always thought I was a Wine Dog and the dogs that lived at wineries were Winery Dogs. Well, that's certainly something I need to study up on. I decided it would be a fun thing to do when I started looking at my owner's Instagram photos from last week. There were lots of dogs in those photos and I wasn't in one of them! In fact Francesca and I were at the Doggie Country Club (AGAIN!) while she toured, did her research, took photos and tasted wine. 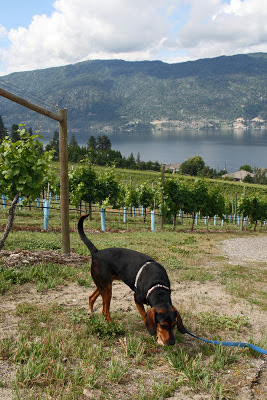 My interest in being a wine dog started several years ago when I got to go to Canada. We visited some wineries in the Okanagan area. I usually waited in the car but at one winery things looked so relaxing I decided to bark my head off and invite myself to the party. Here I am out of the car and joining the party. Then I really got into it. At the next winery I was invited inside. It was a dog friendly winery and people even wanted to pet me! There's something about wine that makes people really nice! I also liked to walk in the vineyards. Here I am sniffing around while my owner takes photos of the view. 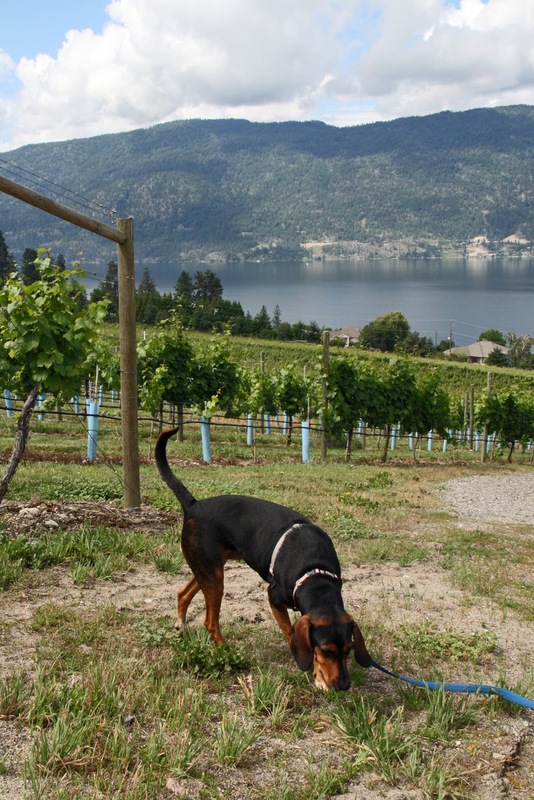 So the Okanagan Wine Country of Canada was my first experience of being a wine dog. 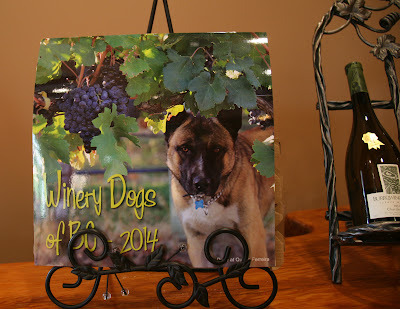 At another dog friendly winery, I spotted this calendar... Winery Dogs of B.C. No one would buy one for me but I put it on my Christmas list. You see... this is where I decided that Winery Dogs lived at wineries and Wine Dogs just visited. I was a Wine Dog. 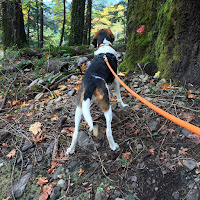 So I guess my owner forgot about all of this when she went touring in the Columbia Gorge Wine Country. 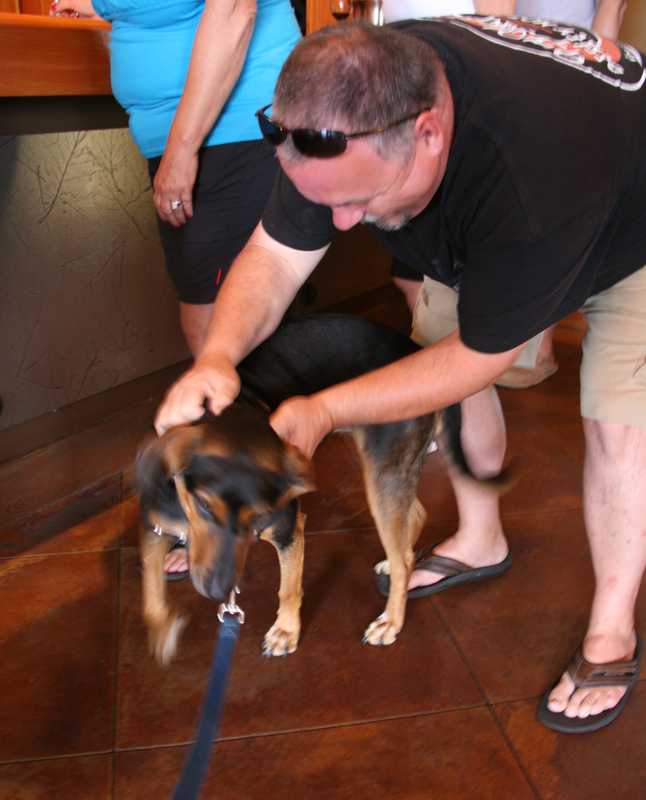 She went to Wy'East Vineyards and was greeted by one of their winery dogs, a white dog with blue eyes. The dog was so loved, and so famous he had his picture painted. It was hung on the tasting room wall. And that wasn't the end of the dogs during that trip. 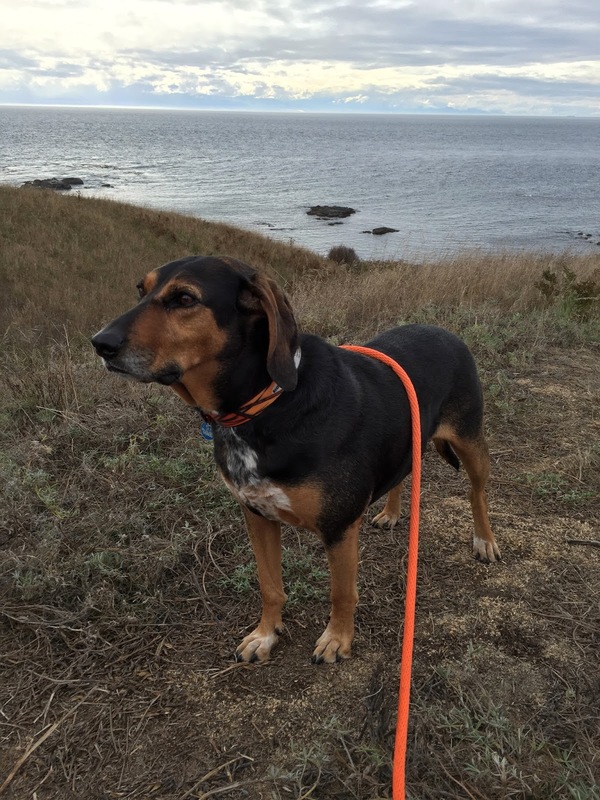 She saw dogs out hiking, dogs visiting wineries, dogs at restaurants and dogs on farms. This is a Wine Dog who is just visiting. 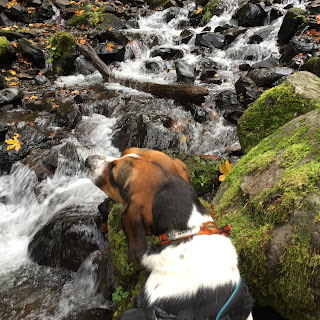 So I wasn't a bit surprised when she included some pictures of dogs in her article about the Columbia Gorge Fall Wine Trail. This all got me thinking. I think I want to go with her next time she follows a wine trail or goes to a winery. 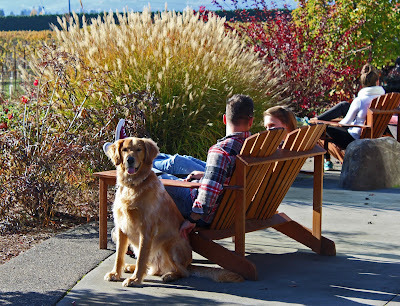 Many wineries are dog friendly. And I, Cinnamon, am an INTERNATIONAL WINE DOG! It was a pretty nice day so my owner asked if I could join in with a group going to the Starvation Creek State Park. I didn't like the sound of that at all so I took some extra dog treats with me just in case there was any starving to be done! It was a long ride, much longer than to any dog park I've ever been to so I knew this trip would be special. I'd much rather go hunting. We parked and got out of the car. 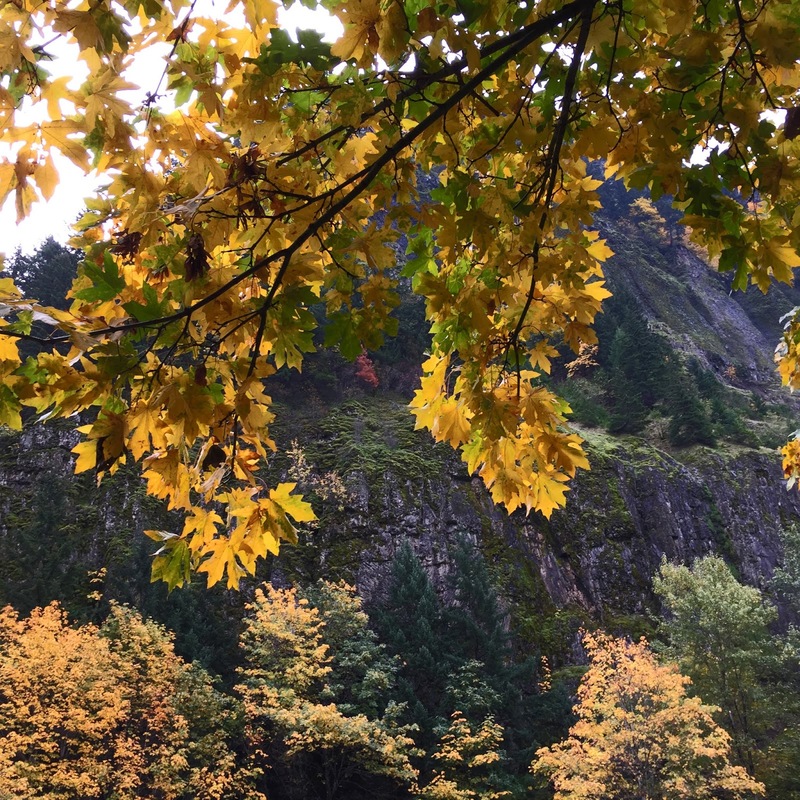 There were huge yellow leaves and some trails. Other dogs were getting out of their cars to go hiking too. Once our friend got there, we headed out on a paved trail. Now that's ok, but I'd much rather go off-trail and sniff for wildlife. 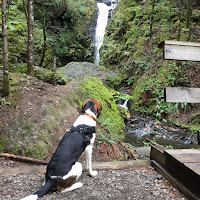 But we were hunting for waterfalls, I was told, so I stayed on the paved path. Soon we got to a waterfall named Hole in the Wall waterfall. I looked longingly at the creek and wanted to go wading, look for frogs and fish, and have fun. But noo..... I had to stay on the path. I looked longingly at the creek. 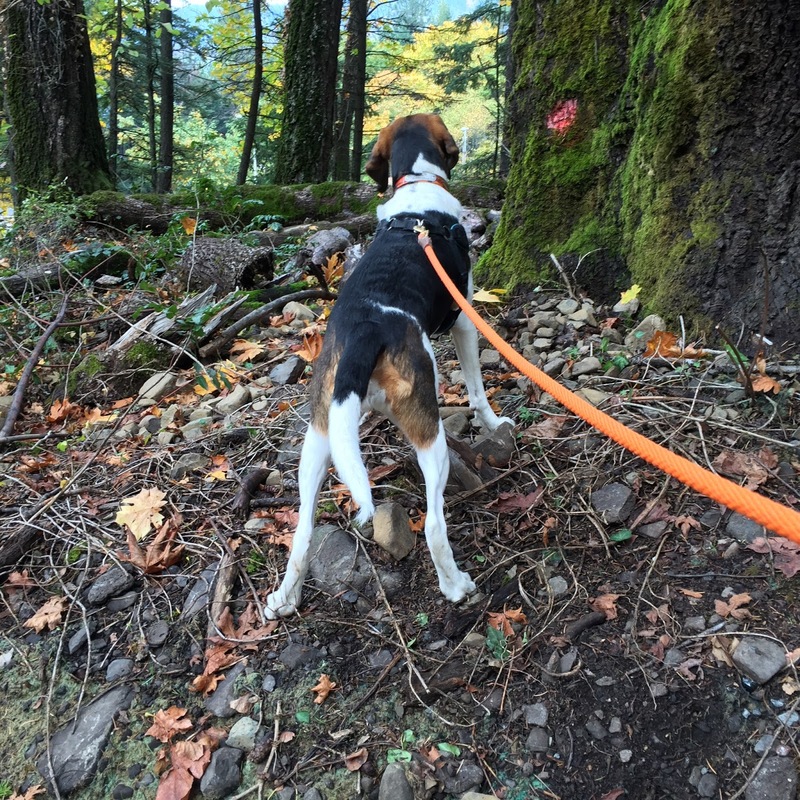 After that, we did go farther and even sniffed around for mushrooms in the forest. It wasn't until we were on the way back that I encountered... the WOLVES! We were minding our own business on the paved trail when I spied them in the distance. Two huge wolves! I immediately started barking a warning to them. "Back off, Wolves," I said. My owner tried to keep me quiet but I absolutely had to bark and scare them. They glared at me. We made it safely to Starvation Creek. I was a little scared because of the name of the creek but my interest in wading and climbing around the rocks diverted my attention. The water was rushing fast. No frogs or fish to be seen. It was kind of fun. Here I am sniffing for fish. I sniffed the moss on the boulders too. But all of a sudden I smelled something I didn't like at all... WOLVES! My hair stood on end. I looked around and, because of the rocks, I didn't see anything at first. But then I saw them... looking down at me. The wolves were hiding behind this tree. They were talking about how to pounce on me! I saw them and started barking. 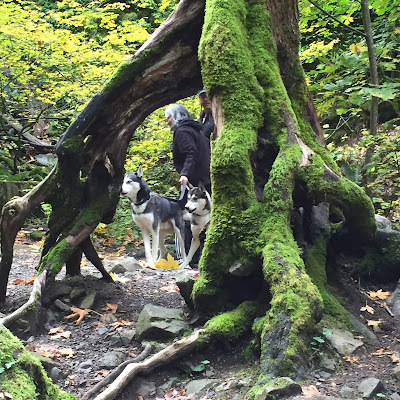 They howled and yipped terrible wolf sounds. They were really scary. My owner helped me hide in the creek. Eventually they left. I guess they figured I had gotten away. I was really scared and walked carefully all the way back making sure I didn't see or smell them. After all, they would have killed me! Really! 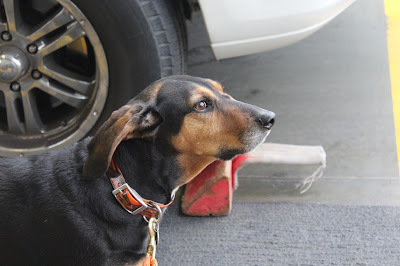 Once I was safely back at the car, I didn't want to go in my crate. I was still on the lookout for wolves. 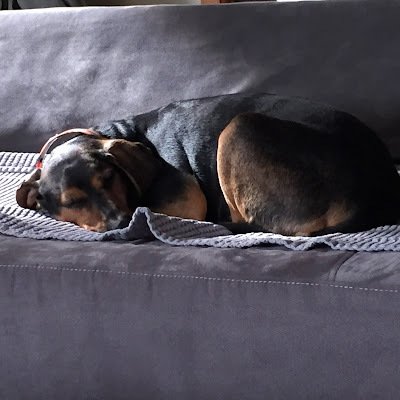 Eventually, I got so tired I went into my crate and slept all the way home. So that, dear friends, is my near death encounter with WOLVES! 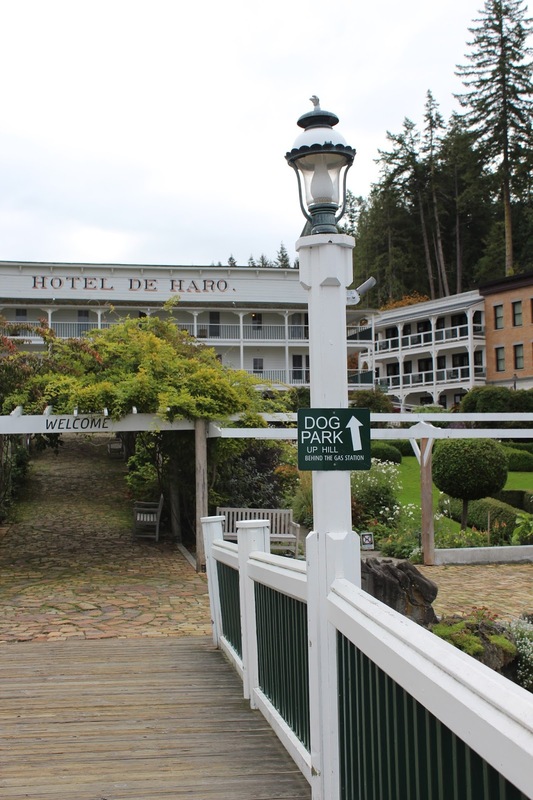 Luxury Getaway to the San Juan Islands… And bring the dog too! 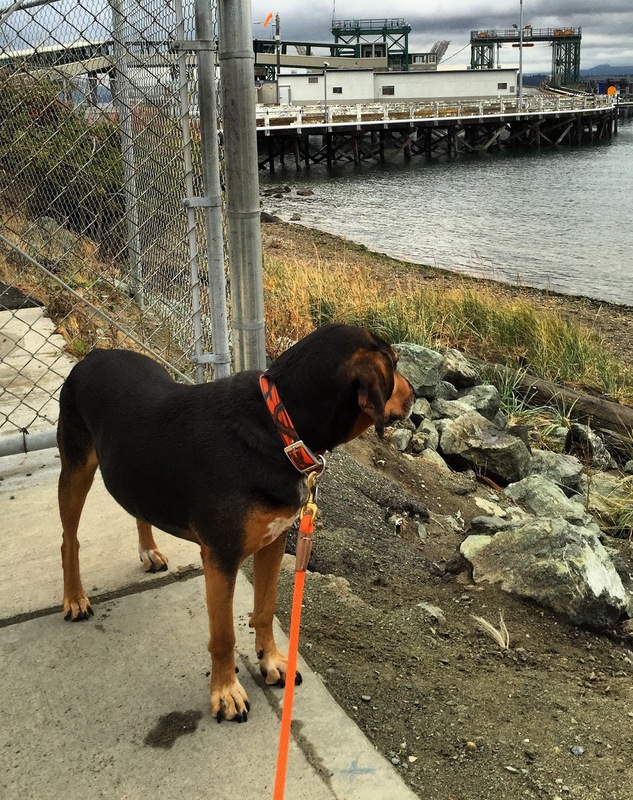 I’ve been talking for weeks about a very special trip I was going to take… a luxury getaway for me, Cinnamon the Coonhound. The destinations? 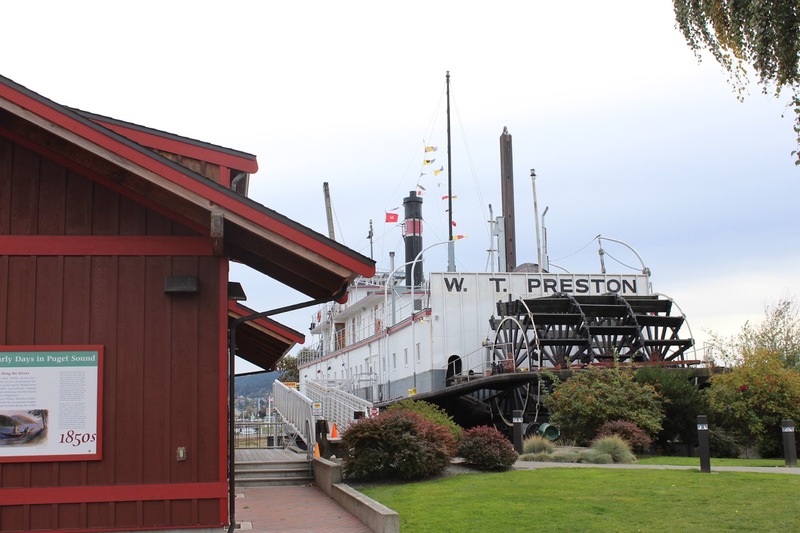 Anacortes, Washington and San Juan Island, Washington. on a huge car ferry. I felt totally pampered and had a great time exploring these northwest Washington destinations. And now that I am home resting up, I’ll tell you all about it. 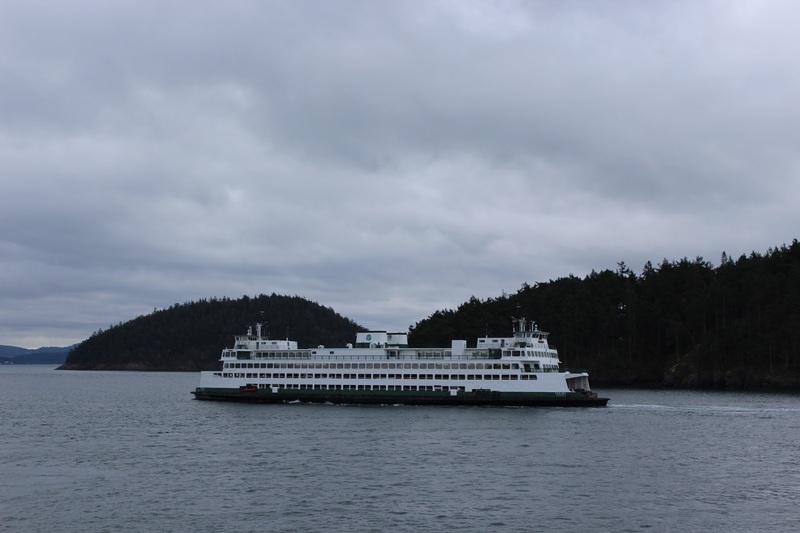 When you take a ferry to the San Juan Islands, you’ll most often be leaving from Anacortes on Fidalgo, Island. So we decided to luxuriate a bit before leaving on the ferry. 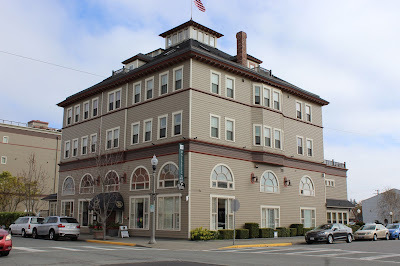 If you stay overnight, check out the beautiful Majestic Inn and Spa. Dogs under 25 pounds (I only wish I was that svelte) are welcome and there is a $50 pet fee. They treat dogs well. But there is a 25 pound limit! But look at what you get… treats, a doggy bone, cleanup baggies, and a welcome sheet for local dog parks, trails, and grooming services. 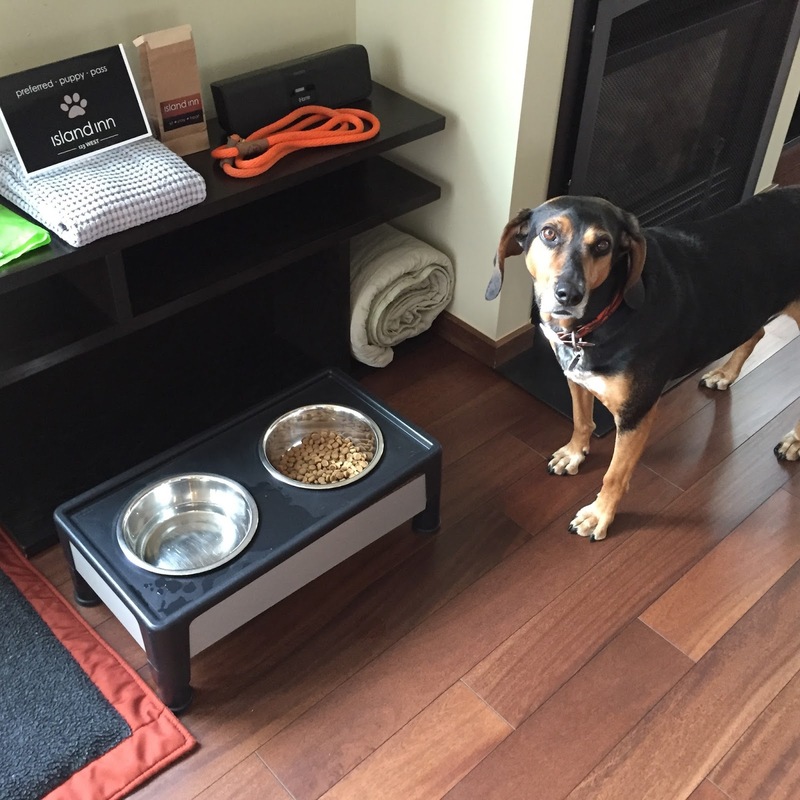 Dog beds as well as food and water bowls are also available upon request. But there are lots of interesting places to stay. Travelocity has a great listing of pet-friendly accommodations in the Anacortes area. 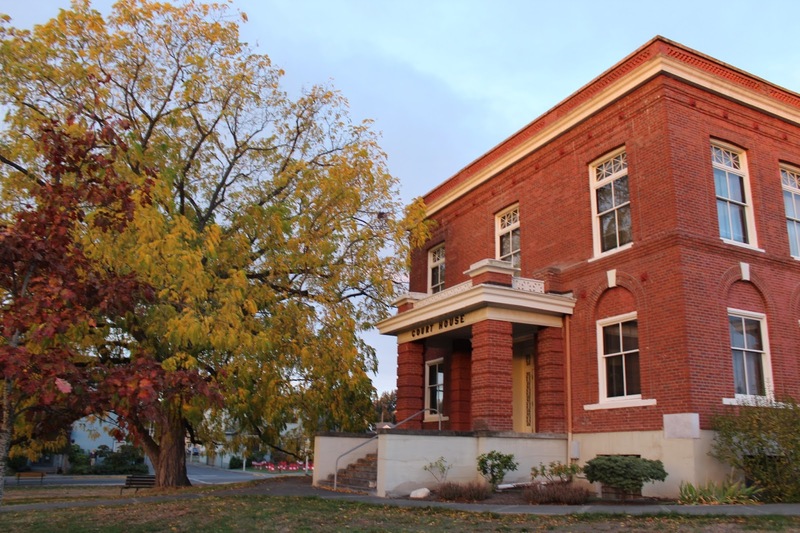 What did I like about Anacortes? I enjoyed their downtown dog park with views of the yacht harbor. After chasing a couple of balls there, it was time for a walk along the docks at the Cap Sante Marina. 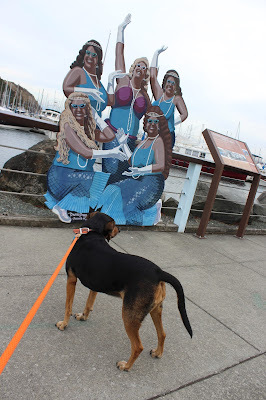 We saw yachts and sailboats for sale, some of the famous (and funny) Anacortes murals and even some of the fish label trash can art. I nosed around the huge W.T. Preston Snagboat ‘cause there was a nice grassy spot that attracted me. Who the heck are these people and why are they memorialized in a mural? And after that, we walked downtown, peeked in windows and planned for our pre-ferry walk the next morning. Next time I go to Anacortes I’ll check out their wooded hiking trails. 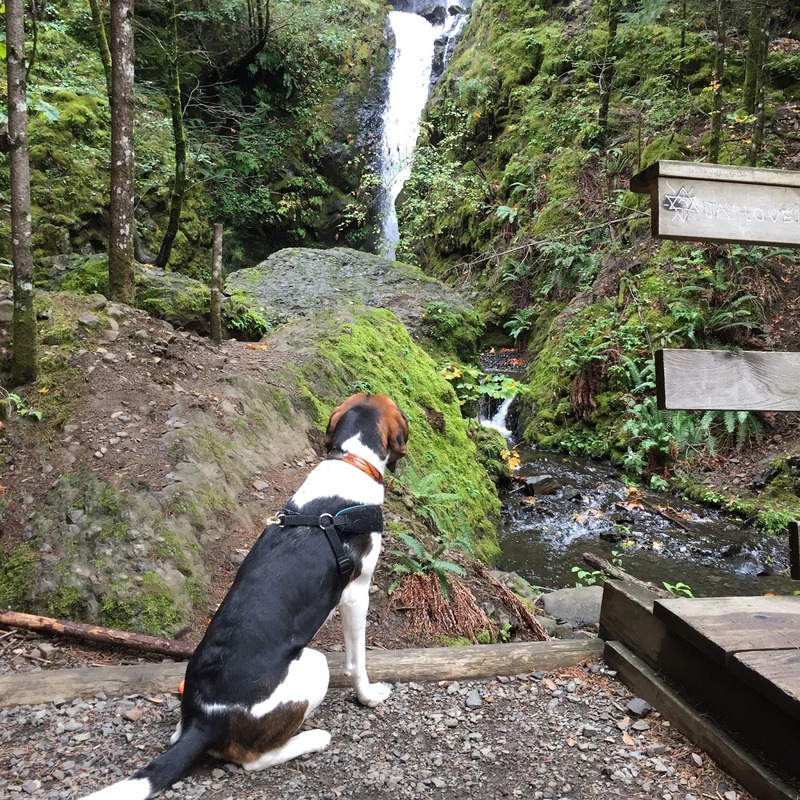 They have tons of scenic places for dogs to hike. 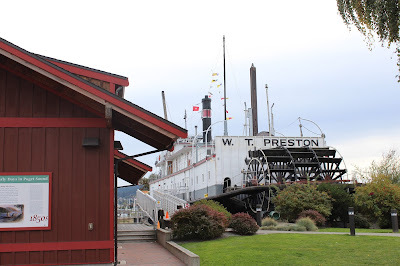 I was up bright and early and we drove the short distance to the Ferry Landing. We paid, parked in line and found a trail down to the small beach and noticed a boardwalk in the distance. 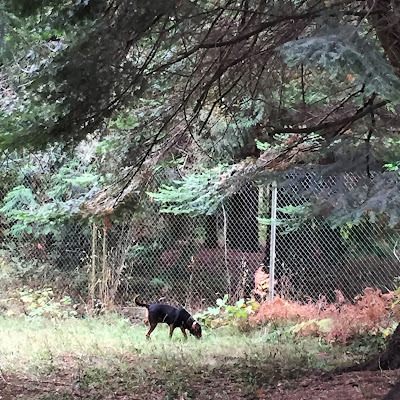 This was the place my dog-friend Hazel’s owner told us about. It was the Ship Harbor Interpretive Preserve. To get to the boardwalk trail you just take one of the paths to the beach and hop on over. You can see birds and, if you are lucky, chase a rabbit! Here I am waiting for the ferry to arrive. Soon it was time to get back to the car because the ferry was in. I sat in the front seat so I could get a good view. They loaded us on and, since this was the beginning of the off-season, the whole second car deck was empty. I could walk around and pretend I owned the ferry! We also went through the “people deck” where I sniffed the food they had for sale at the snack bar. But dogs have to remain outside… fooey! It was a beautiful, smooth crossing. My ears flapped in the wind. I watched for whales but we didn’t see any. I thought there might be bears and deer on the islands we passed. but the scenery was to die for! Once we docked in Friday Harbor we were the first ones to drive off the ferry. We turned right and saw our home for the next two days, Island Inn at 123 West. I walked up the office and was greeted by the staff who gave me a treat. 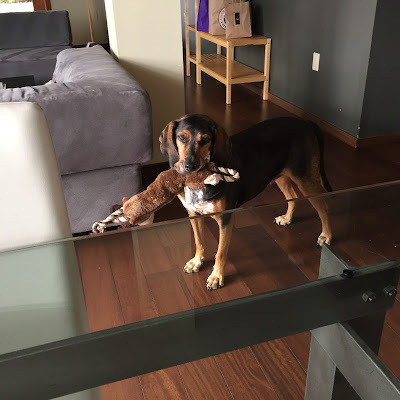 Now they know how to win a coonhound’s heart! I noticed a dog bed and toys and was told that they were for the resident dog…. not really for me! Portland's Pearl District. Our Penthouse was at the top left.. the yellow walls with windows. Then up the outdoor stairs we went. We climbed to the very top to Penthouse 7, our luxury accommodation. We opened the beautiful doors and there it was! A Euro-chic penthouse with huge windows and hardwood floors. There was original art throughout this one-bedroom, two bath, full-kitchen HUGE penthouse. And, next to the fireplace was something just for me! They really know how to treat dogs at Island Inn 123 West! pick up bags, cookies and a special dog paw sign. How luxurious is this! Of course I needed some food and water in my fancy raised stainless steel bowls. And, perhaps one of those special treats! Island Inn at 123 West has three dog friendly spaces. I got to play with my new toy in our Penthouse. 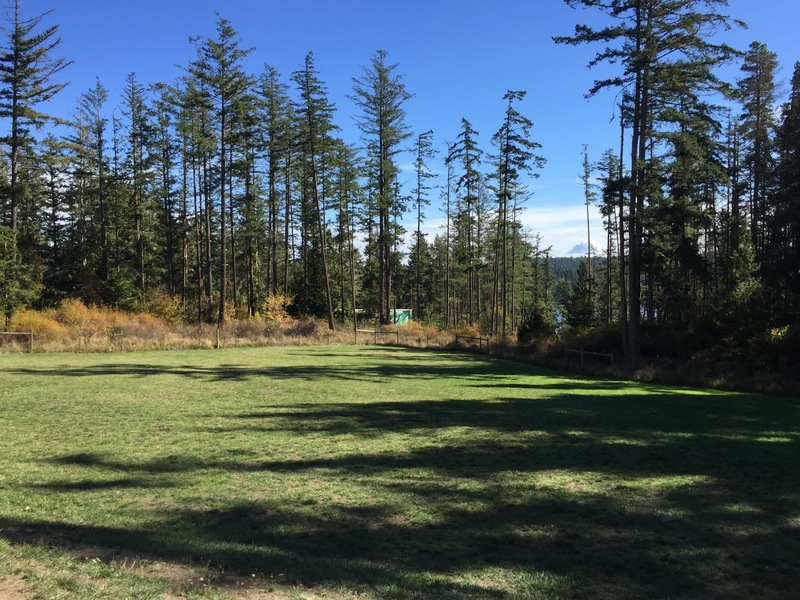 After we checked out the penthouse, we decided it was time to explore San Juan Island. We picked up a lunch at the San Juan Island Cheese Company and headed for the dog park! Near the airport we found Eddie and Friends Dog Park, a two-acre park with woods and balls to chase. There were a couple of island dogs there but I just wanted to sniff around. But we had much more to see. We drove for awhile and turned in to American Camp National Historic Park. 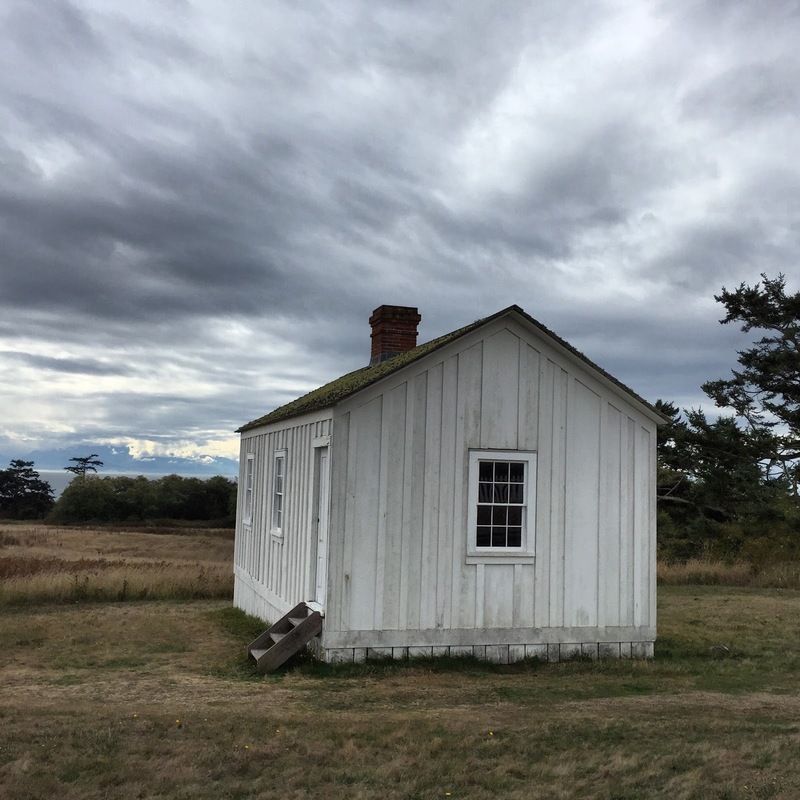 When Great Britain and the United States in 1859 agreed to a joint occupation of San Juan Island until the water boundary between the two nations could be settled, it was decided that camps would be located on opposite ends of the island. This is where the Americans hung out. My owner thought the whitewashed buildings were beautiful. There were buildings and fences. We hiked around and then saw a trail to Granny’s Cove. Now my owner is a Grandmother so we decided we MUST see Granny’s Cove. 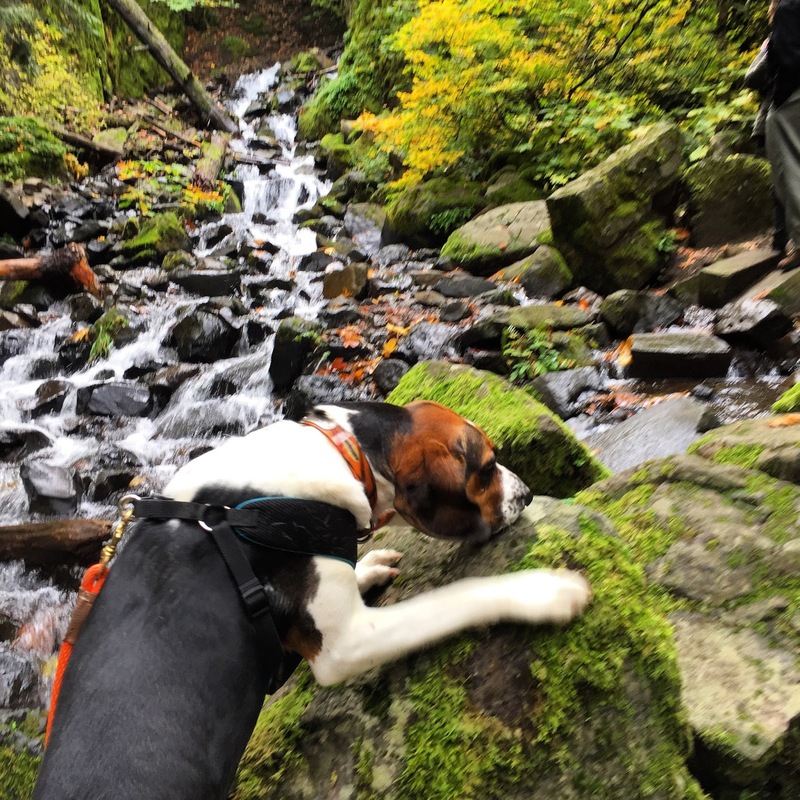 I did a lot of sniffing on that hike. I think ground squirrels and rabbits used those trails. Then we saw it… the ocean and Granny’s Cove. I wanted to go down to the beach but my owner wouldn’t let me. We did some more sightseeing in the car (because I was tired) and then headed back to the Penthouse for dinner and a relaxing evening watching…. What? The Vice Presidential Candidate’s Debate? I would have much preferred The Animal Channel. 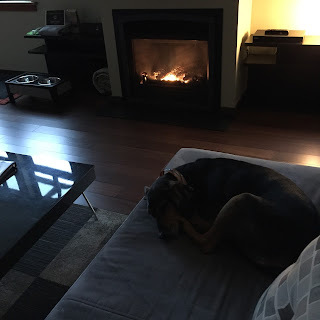 It got chilly so we turned on the gas fireplace and I went to sleep cuddled up on the couch warmed by the glow of the fire. It had been a good day and I was truly luxuriating. Our day started at dawn. I couldn't blame my owner for waking me up to see THIS! The next morning we woke up at dawn to see an amazing sunrise. I would have slept longer but my owner wanted to take pictures. We went for a walk from the Overlook Park next to Friday Harbor House. They were having breakfast overlooking Friday Harbor and the marina (no one invited me in for a luxury breakfast, unfortunately). We went past the Whale Museum and checked out the beautiful fall leaves at the Court House. I liked walking under these trees on the old Courthouse lawn. We returned for breakfast and planned a day going to Roche Harbor to see the sights. I heard they had a dog park there and I needed to check it out, of course. We drove all the way (25 min.) 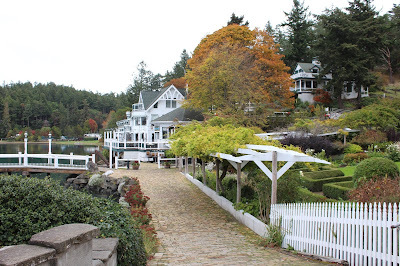 to Roche Harbor passing a winery, huge cows in their pastures and even a camel (yes, really). 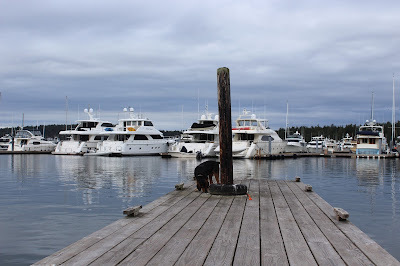 Finally we got to Roche Harbor and drove to the marina and historic resort. We walked the docks. 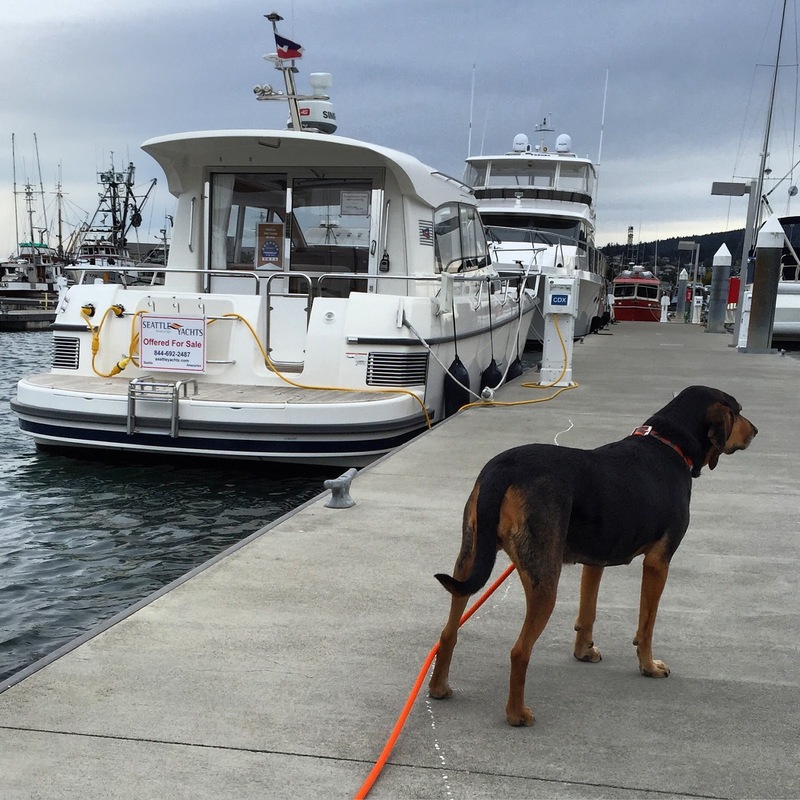 I sniffed around and tried to board a couple of yachts but I was on my leash so didn’t quite make it. 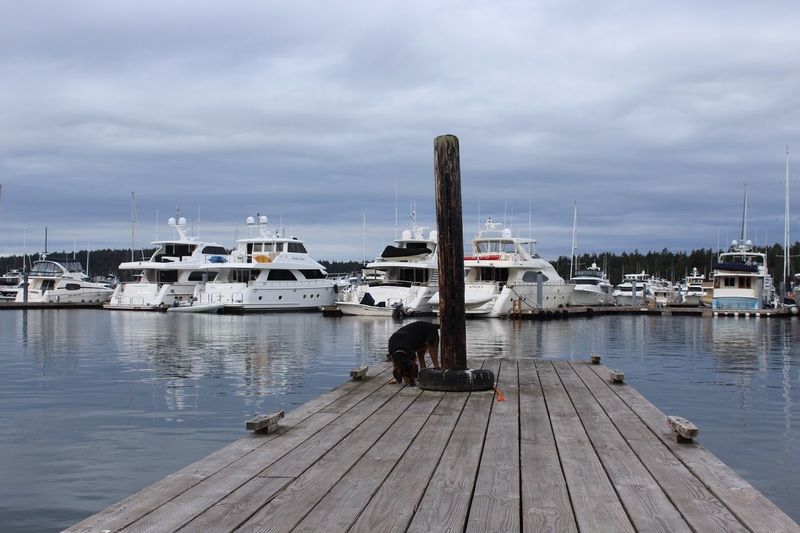 Here I am sniffing around the docks at Roche Harbor. I also checked out the huge yachts. We walked past the old Lime Kilns, through the formal gardens and along the water. It was a glorious sunny day. 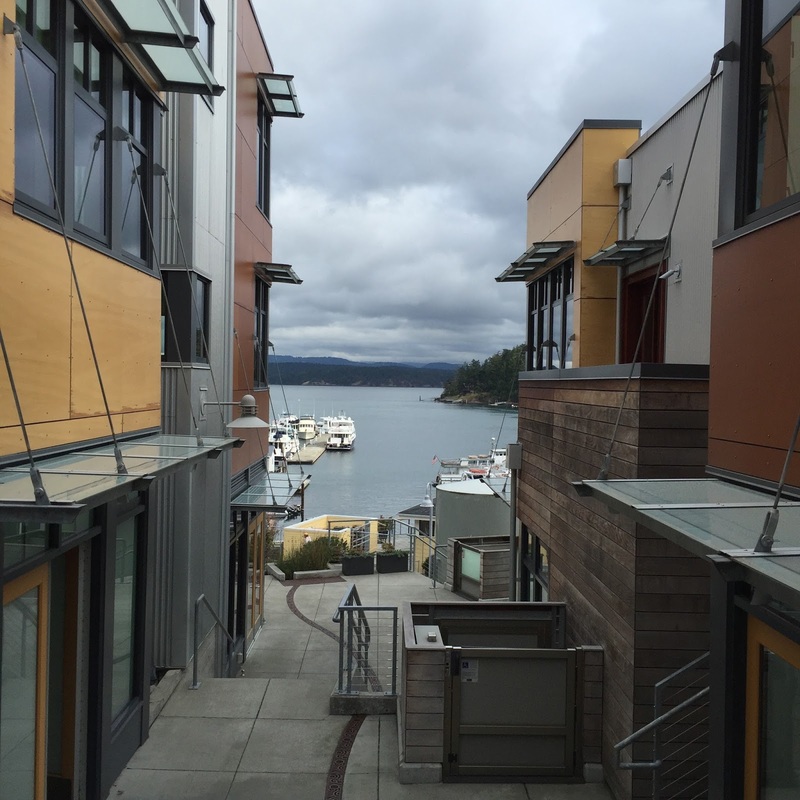 I loved Roche Harbor. I hear it is dog friendly so I think I’d like to go stay there sometime. They had my kind of yachts there, big enough to run around on. You can tell why I want to have a vacation here next time. 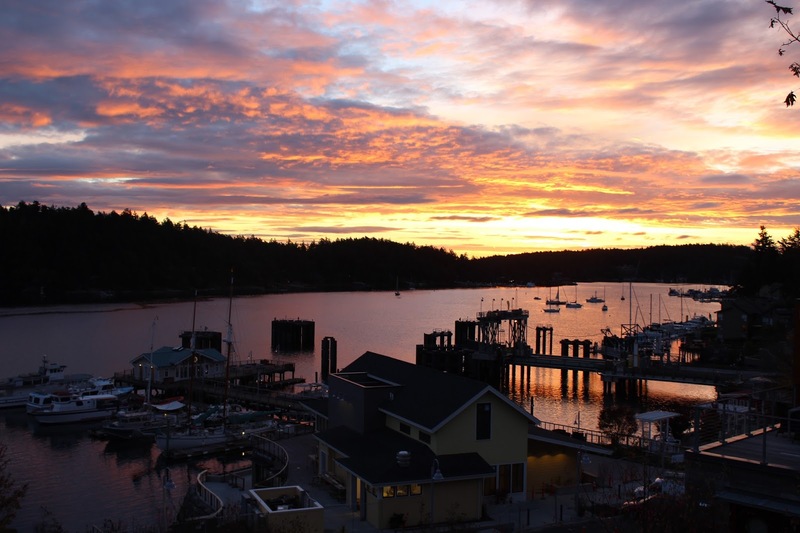 Isn't Roche Harbor amazing? And they have plenty of places for dogs to walk. And, in the summer, the restaurant has a deck where dogs are allowed! Then I saw a sign, “To the Dog Park!” So of course we had to follow the sign up the hill. And then I went into the dog park. It was surrounded by woods and had beautiful green grass. There weren’t any other dogs there so I just relaxed and sniffed around. My owner sat on a bench in the sun and let me have free time. I loved that park! This sign led me to the Dog Park. Soon it was time to leave and go to our next stop… the San Juan Islands Sculpture Park. I wasn’t too into art but I soon realized this was a very special place. 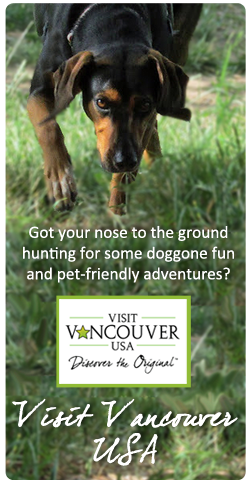 They welcome dogs and, in fact, dogs could be off leash if they are well-behaved. Well, I’m not all that reliable off-leash so I went with my owner to enjoy the sculptures, the trails and the nice people who couldn’t resist petting me. 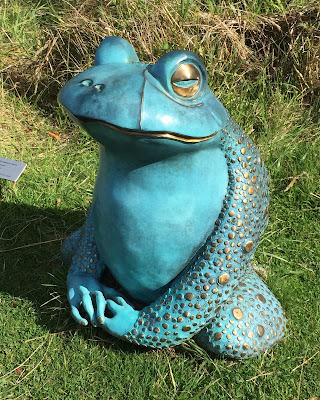 My favorite sculpture was a big green frog by the pond. I’ll be there were real frogs in the pond, too! that it was dog friendly! The people were nice too. They petted me. This was my favorite sculpture. the pond at the Sculpture Garden. We really enjoyed our time there but we had one more important stop to make… the Pelindaba Lavender Farm. 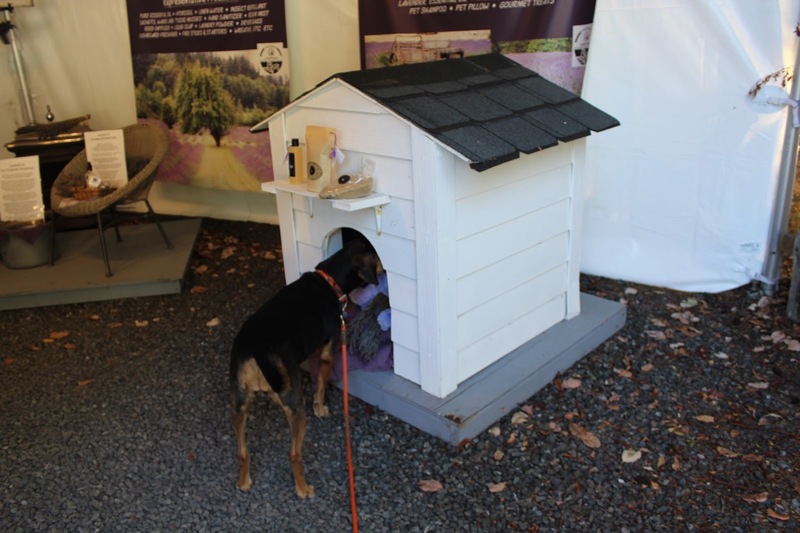 Why would you take a dog to a lavender farm? Well, this one is VERY dog friendly! 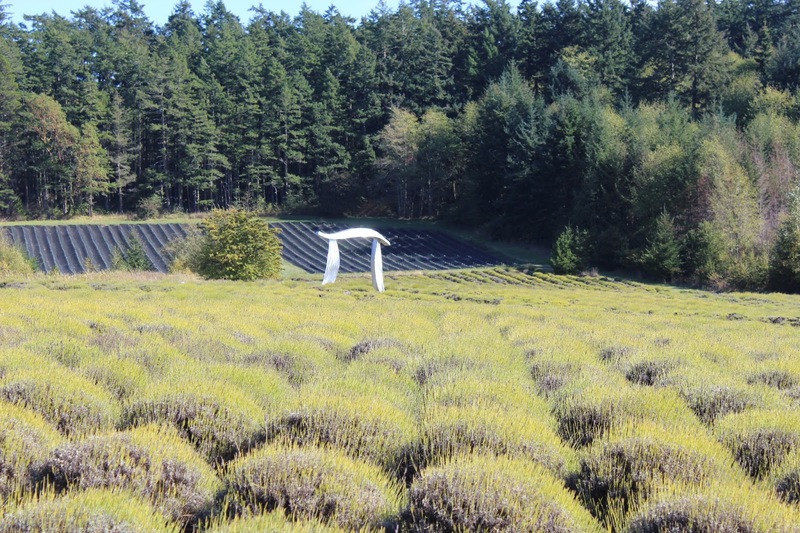 The lavender farm is organic, huge, and they make products with their own lavender. I heard they had some great dog products there! I wanted to go shopping. But first we walked out into the fields. The first thing I noticed was that I smelled the sweet smell of lavender even though the blooms were past their prime. 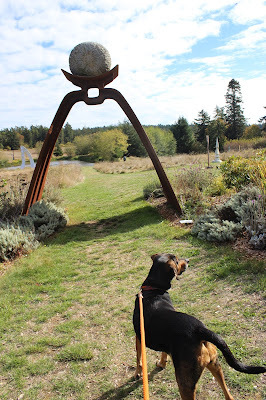 I saw some huge metal sculptures by the artist Micajah Bienvenue that looked like the ones I saw in Roche Harbor too. and check out the metal sculptures. But then it was time to go to the Visitor Center and shop. We opened the door and I was hit with an even stronger smell of lavender. The lady inside said it was fine for me to come in… so I did. And I sniffed everything. I was starting to feel sleepy so we went outside to look at the displays and learn a bit about how they process the lavender. I spied a dog house so had to go over and take a look. That was where they displayed their dog products. Imagine! 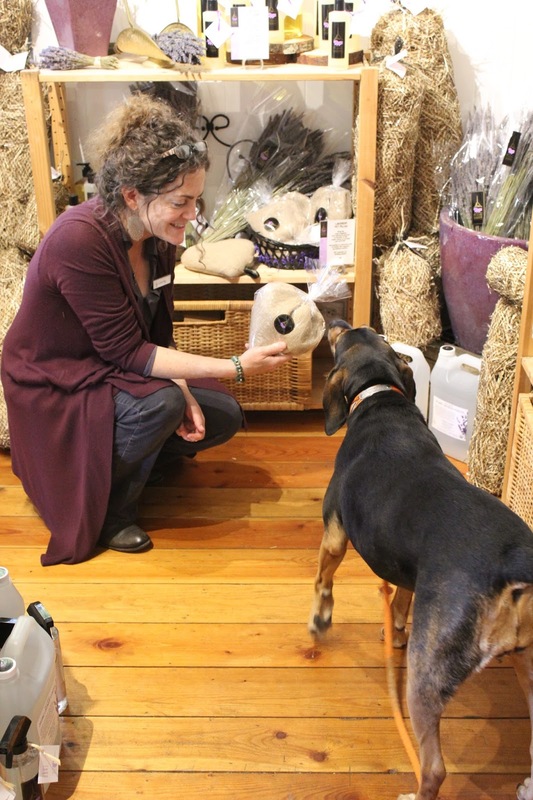 Luxury lavender products for dogs! at the Pelindaba Lavender Shop. They were so nice to me! We went back inside to do our shopping and the nice lady showed me each and every dog product. And I found out they have a shop not so far from where I live. It’s in the Pearl District of Portland. Here I am checking out the dog house. It was filled with lavender products for dogs! I was sleepy from all that lavender so it was time to head back to our luxury Penthouse, have dinner and then take a little walk along the docks before bedtime. It had been a perfect day… sunshine, good smells, walking and shopping. What more could I ask for! You never know what you will see when you walk the docks. 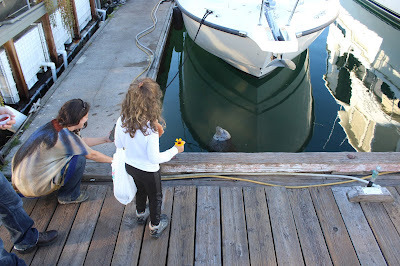 Here is a seal looking for a fishy hand-out. Here I am falling asleep after all that lavender! I went to sleep dreaming of my next luxury vacation… Roche Harbor! But I don’t think I’ll tell Francesca how wonderful my trip was or she’ll want to come too! Of course my advice is… take your dog! 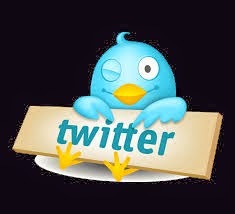 Hey everybody. I'm all packed and ready to go. This morning when Francesca went to the Doggie Country Club I was really sad. Not that she was going, but that I was, somehow, missing out on something good. 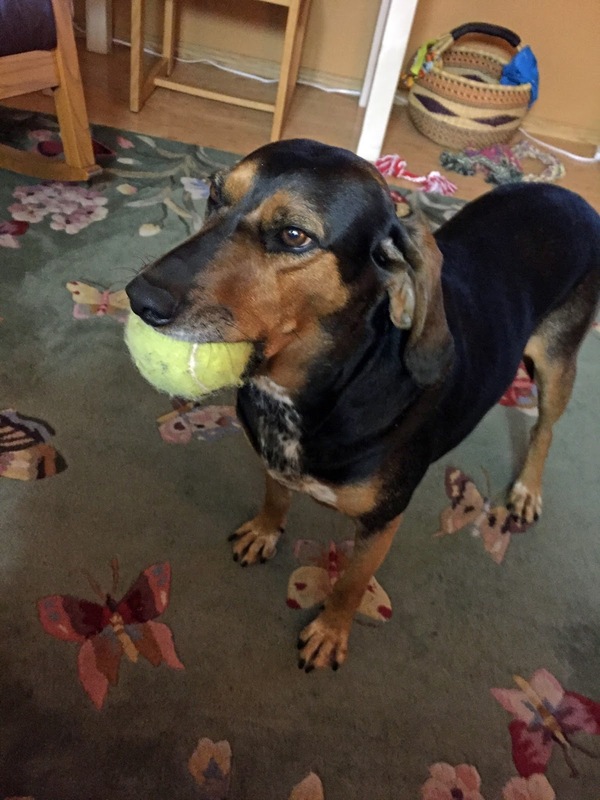 Can I take my ball too? But as soon as we got back home and packed my things, my mood brightened because then I realized I'M GOING ON A TRIP! I love trips. 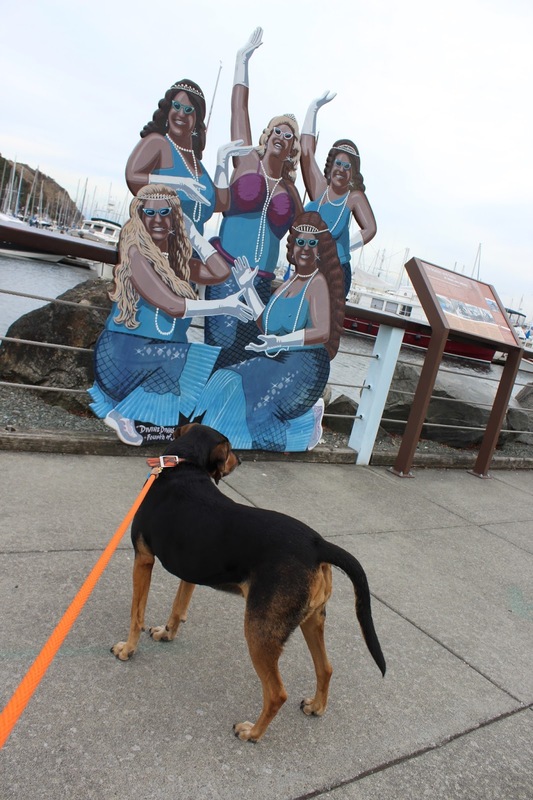 I am looking forward to walking along the marina in Anacortes and looking for a mural with a dog in it. They have a whole bunch of murals there! This is only part of what I packed. I also took our new toy and a nylabone. And then there is the ferry ride tomorrow. I'm up for that! I have my float jacket and everything. I'm a salty dog, remember? I'll be posting on Instagram and writing articles about my trip. So wish me well!